Levi’s Stadium is set to host a marquee matchup between two of the biggest soccer clubs on the planet, this summer, when Spanish giants Real Madrid host English powerhouse Manchester United on July 23 at 2 p.m.
Real Madrid is fresh off winning the UEFA Champions League, international club soccer’s ultimate prize, for the 12th time, more than any other club in history. Madrid also won their domestic league, La Liga, for a record 33rd time during the 2016-17 campaign. Manchester United did not fare quite as well in the Premier League this season, finishing sixth, but made up for it by winning the Europa League for the first time in club history. 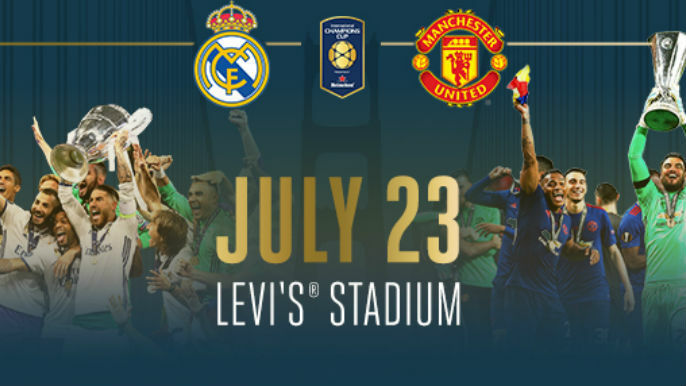 This is the third season in a row Levi’s Stadium has hosted a marquee matchup for the International Champions Cup, which is an annual club association football friendly exhibition competition featuring clubs from all over the world. Real Madrid won the competition in 2013 and 2015, while Manchester United won in 2014. Don’t miss this incredible opportunity to see two of the greatest clubs in history compete on American soil! Head here for tickets.